The SEC whistleblower statute has a section that bars employees from certain named government agencies from SEC whistleblower award eligibility. However, the statute is silent as to the SEC whistleblower award eligibility of employees of other government agencies. 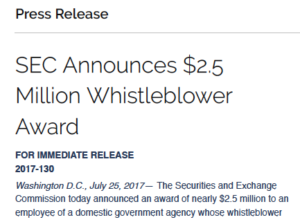 On July 25, 2017, the SEC announced that it had granted a $2.5 million SEC whistleblower award to an employee of a domestic governmental agency. In doing so, the Commission clarified that employees of domestic agencies that are not listed in the statute, and also certain employees of “hybrid” government agencies, do have SEC whistleblower award eligibility. In general, U.S. government employees do enjoy SEC whistleblower award eligibility. The Commission recognized this in its Order granting the award: “Generally speaking, an employee of a federal, state, or local government can … be eligible for an award under our whistleblower program”. An “appropriate regulatory agency” is defined to mean the SEC itself, as well as certain “banking agencies” listed in the SEC whistleblower statute. 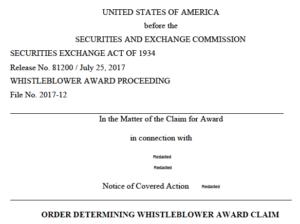 The Order said that employees of “appropriate” domestic regulatory agencies are not eligible to receive awards under the SEC whistleblower program. While it may sound odd to say that employees of “appropriate” agencies are excluded, this seems to have simply been a way for the Commission to use shorthand to refer to those agencies listed in the statute, rather than writing each agency’s name out in the Order. According to the Order, the first exception “has no potential application to Claimant given the governmental authority at which Claimant worked”. This language seems to mean that the SEC considers employees of domestic agencies that are not listed in the statute to be eligible to receive SEC whistleblower rewards. The statute also excludes employees of “a law enforcement organization” from receiving SEC whistleblower rewards. Most of the time, the application of this exception would seem to be rather obvious. However, there are some domestic government agencies that have both a law enforcement function and one or more non-law enforcement functions. For example, the U.S. Postal Service has employees or units that investigate mail fraud, which could be considered a law enforcement function. But it also has employees or units that deliver mail, which has no law enforcement component. Domestic agencies that have both a law enforcement function and a non-law enforcement function are referred to as “hybrid” agencies. The Order explained that an employee of a domestic hybrid agency is eligible to receive an SEC whistleblower reward if he or she works in a unit or division of the agency that does not do law enforcement work.